Initially, anyone who has natural gas service from Columbia Gas was told to evacuate their homes. Columbia Gas teams started going block-by-block to help evacuate the affected areas and to shut down power in Lawrence, North Andover, and Andover as a precaution. Later Lawrence Mayor Dan Rivera all residents of South Lawrence to evacuate their homes. In Lawrence, a man was killed when a home exploded on Chickering Road. 18-year-old Leonel Rondon was inside a car in the driveway of the home when the explosion causes a chimney to fall on it. Rondon was pronounced dead at Mass General Hospital. 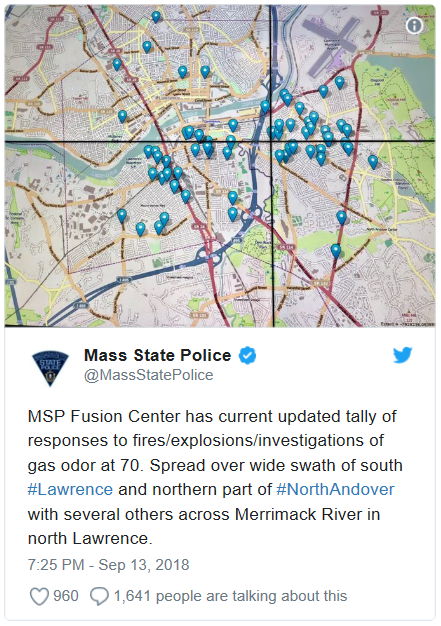 There were 38 fires in Andover alone. All those fires were extinguished by 6:45 P.M., but at one point, 18 fires burned simultaneously. At least three people have been injured in Andover, including a civilian and two firefighters. 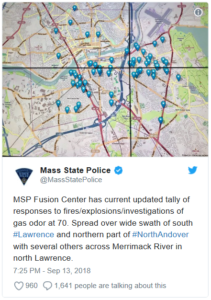 Lawrence General Hospital was treating 13 patients from the explosions, ranging from smoke inhalation to “traumatic blast injuries.” Andover Fire Chief Michael Mansfield said this was the worst he had seen in his 39-year career. It is still not clear was caused the explosions. At this point, there is still a lot more work left to be done. Mansfield estimated it could be a week and a half before all the homes in Andover are cleared.